The fun, funny, creepy and thrilling world of Goosebumps. star in Columbia Pictures' "Goosebumps." Zach (Dylan Minnette) is our young hero. After the death of his father, he’s moving with his mother to a small town in Delaware. He’s going to be the new kid at school where his mother’s the vice principal, but luckily there’s a cute girl living next door. Unbeknownst to him, his next door neighbor is famed children’s author R.L. Stine who has created some of the creepiest monsters which would be best if they remained fictional in the pages of books. Of course Goosebumps would not be Goosebumps if these monsters didn’t come to life. On the good side, the film had a really quick pace. It didn’t introduce any unnecessary subplots (I would argue the romantic subplot between hero and neighbor is necessary) and the introduction of each character was quick and efficient – after all we really only need four: the young hero, the cute girl, the weird best friend, and the adult to help guide all the action. The villains have already been created. On the down side, the villains, the monsters previously created by R.L. Stine, literally came out of the pages of the books. And I mean literally – open a book, and the letters on the page jump out and twirl into a living breathing monster right in front of you. Surely they could have come to life in a more creative way, but no time to dwell on that as the action keeps unfolding. 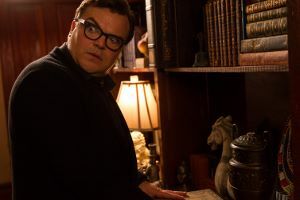 Jack Black stars in Columbia Pictures' "Goosebumps." Those who are more acutely aware of the Goosebumps series will remember all the popular monsters which come back for more good haunts. The younger ones in the audience loved them. But I also appreciated all the obstacles the monsters put in front of our heroes. Lots of funny and tense situations that they had to get out of. And that’s the heart of these books. Creating characters that are easy to root for, and let us laugh while being in fear for them at the same time. Perhaps one of the more surprising achievements of this film is that we got Jack Black’s best performances in years. Finally his manic comedic heights have been subdued into something substantial, interesting, and still funny. Manic Jack Black can be great, subtle Jack Black is great, but a more subdued version, not quite manic, where he can be both creepy, funny, and the caring adult who has his own personal struggles is even better. We haven’t seen him quite this way before and he was a lot of fun. The 3D is never really utilized and feels like a total cheat. The world of Goosebumps was vividly created with just words on a page. The movie translated that well and nothing else was needed.